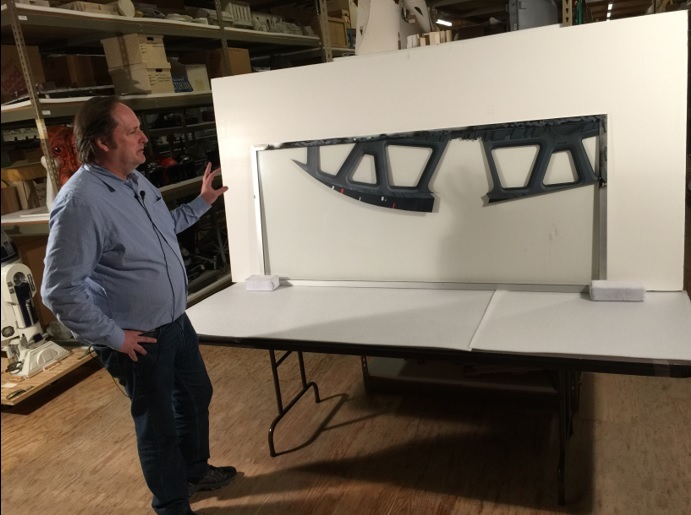 While the average Star Wars fan has already seen Rogue One 17 times, he has no clue what a Bondo or a Chituhr is. In fact, he probably hears those words and assumes one refers to automotive putty and the other is an uncouth slang term for "bathroom." Nevertheless, the unreleased figures developed for the short-lived Ewoks line are among the primo pieces available to collectors of pre-production material. Six new figures were set for release in 1986, when the line was unceremoniously cancelled. They are: Chituhr, Chief Chirpa, Bondo, Paploo, Morag, and Weechee. Putting together a full set of these figures -- in any form -- is a labor worthy of Hercules, or at least Lou Ferrigno. But the story concerning unreleased Ewoks figures doesn't end there. 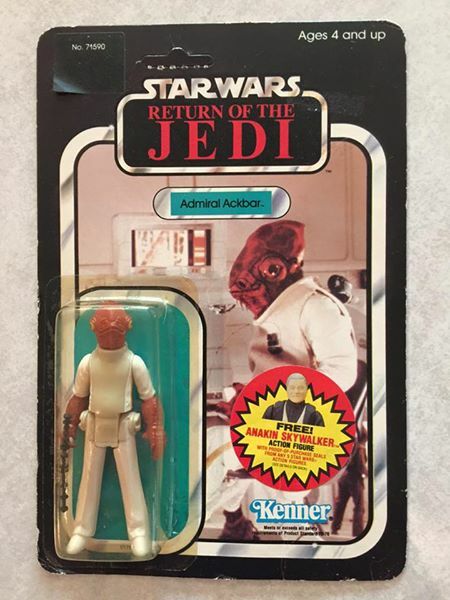 Four additional characters from the animated series are known to have been considered for release by Kenner. While they were cancelled prior to production, their existence is worth considering when discussing the line and speculating about its history. 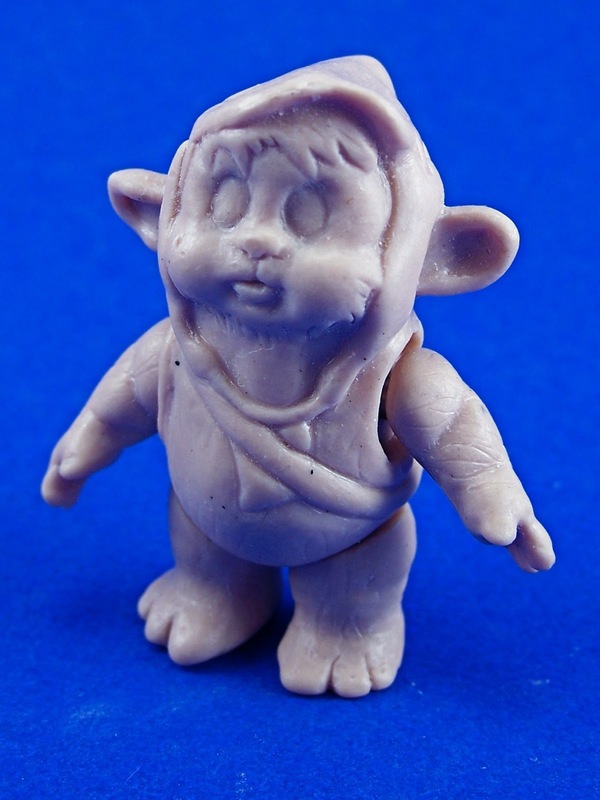 The first figure we'll discuss is Teebo. Although the Teebo released as part of the Return of the Jedi line wore a helmet made from a slain pig, his namesake from the animated series was anything but a tough customer. 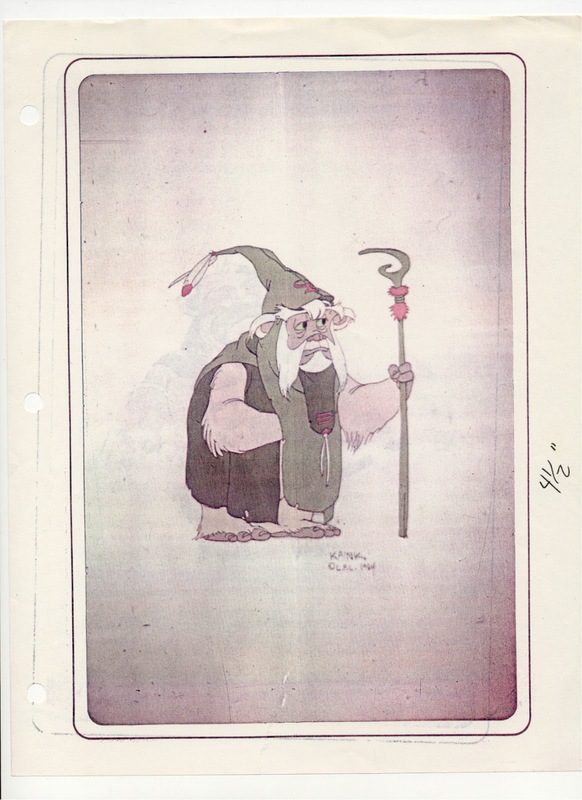 As is noted on the above model cel, made for reference by the animators at Nelvana, the cartoon Teebo was a poet who wore a cowl that made him look like a hairy Keebler elf. Ewok poetry is unique in that it consists solely of words rhyming with "nyub." 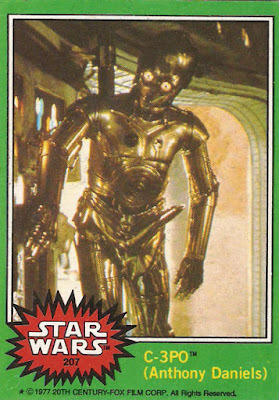 According to the ever-helpful Wookieepedia, Teebo was featured in most of the Ewoks episodes aired over the show's two seasons, meaning he was one of its principal characters. Wookieepedia also makes the claim that "Teebo had a rocky courtship with Latara, eventually getting together with her in his later adolescence..."
Is this the only known instance of an Ewok hookup? 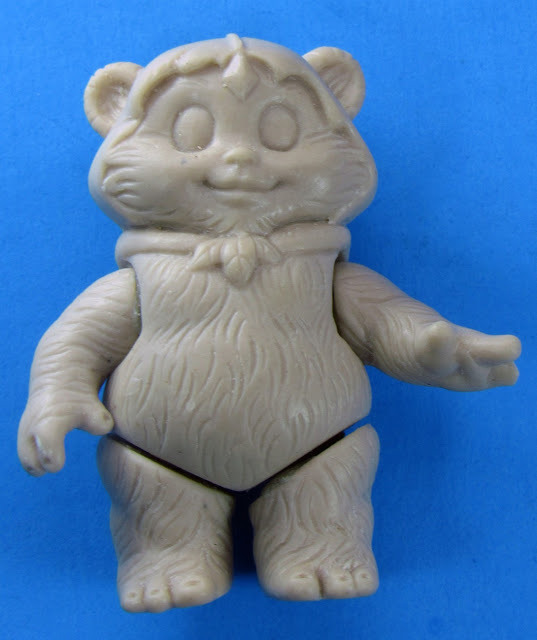 The overall look of the existing Teebo prototype closely matches the character seen on the model cel. 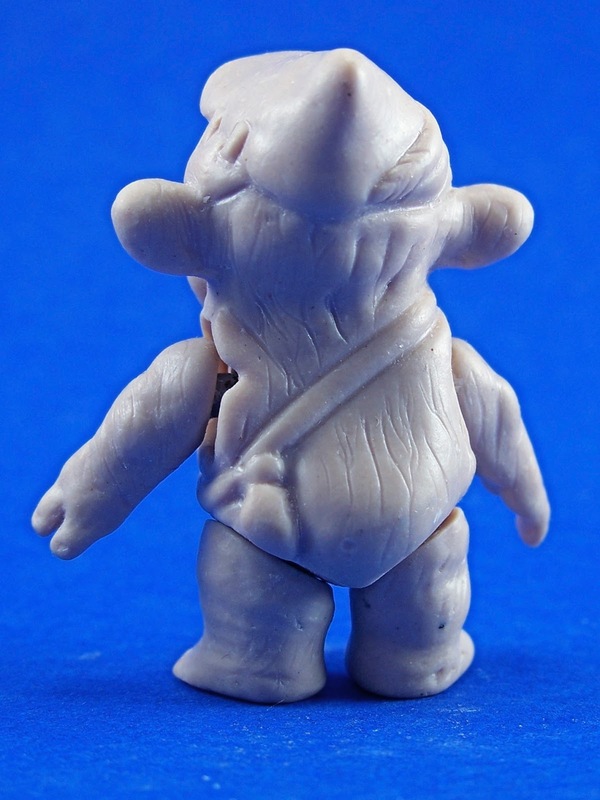 Teebo's details are less sharp than those found on the other figures we'll discuss. This may indicate that less work was done on Teebo. Kenner is also known to have done some work on Latara. I guess they pretty much had to. 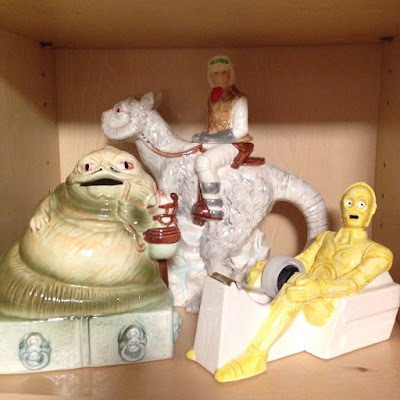 Had there been no Latara figure in the line, with whom would Teebo get it on? Like Teebo, Latara was a central figure in the show, appearing in the majority of episodes. Per Wookieepedia, she was self-involved and craved attention -- which makes her sound like the Blanche Devereaux of the Ewok Village. The existing Latara figure is interesting in that, though it displays a high degree of finish, some of its details differ from the final(ish) character design seen on the model cel. Most obviously, the model-cel image displays a prominent lick of hair and a braid, neither of which is evident on the figure. 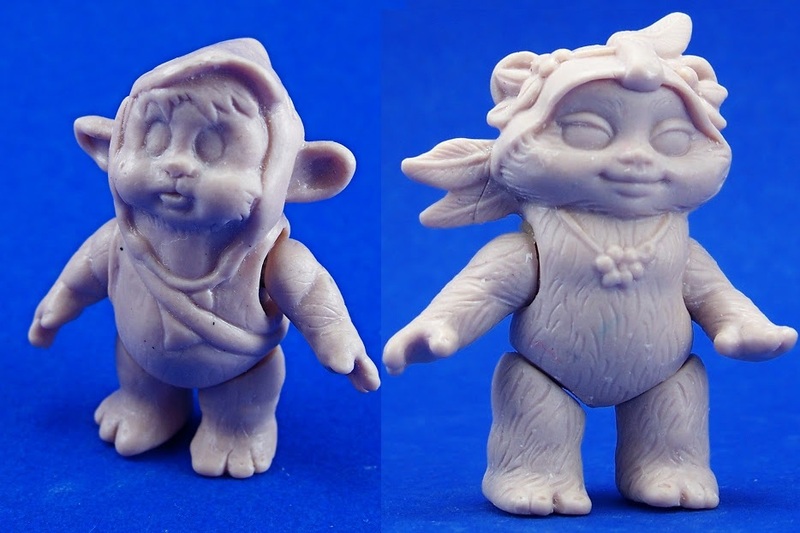 Lest Latara be the sole Ewok damsel tasked with fending off the advances of amorous Teebo, Kenner also planned a figure representing Kneesaa. Chief Chirpa's daughter, Kneesaa was a sweetheart, a princess, and an unapologetic member of the Ewok One Percent. Like Latara, the Kneesaa figure is worked to a pretty high level of refinement. You can imagine a production figure looking very much like this. 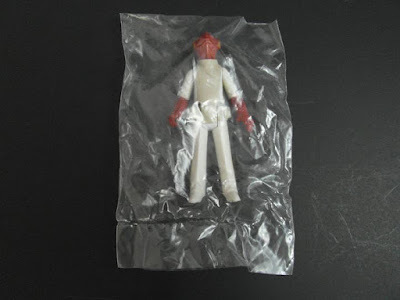 The back of Kneesaa reveals that Kenner shortened her cape considerably, probably because a cape that draped over the legs would not have been viable absent a separate rubber or softgoods element. Kaink first appeared in the live-action made-for-TV movie, Caravan of Courage. If you don't remember her, it's probably because your brain has erased all memories of Caravan of Courage as a means of preserving your mental well-being. Kaink also appeared in the animated series, where she helped Wicket restore the Ewok Battle Wagon, so that he could heroically -- uh -- help Kenner sell toys to captive and suggestible children. 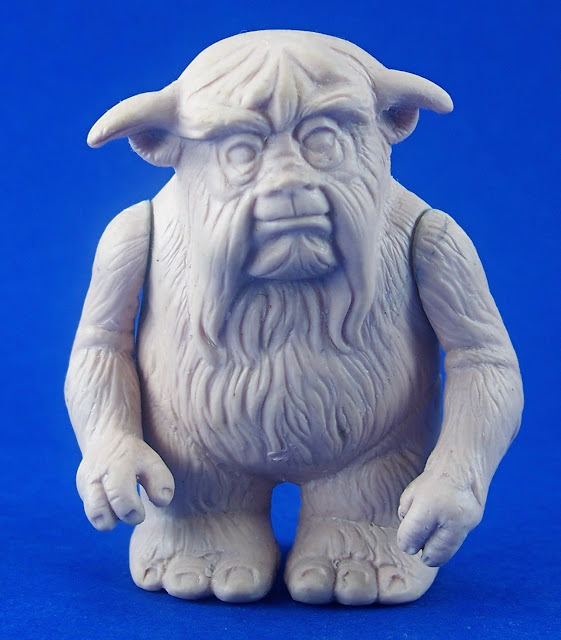 When this Kaink figure first surfaced, it inspired some debate as to whether it represented an Ewok, a non-Ewok character from Ewoks, or something wholly unrelated to Star Wars, like a berserker mogwai. 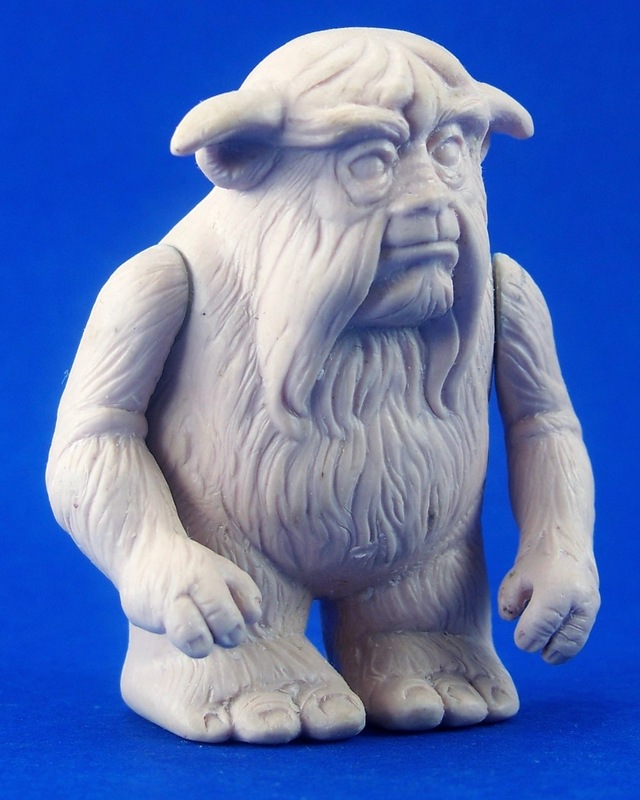 Kaink looks sort of unusual for an Ewok in part because of the presence on the figure of those horn-like protrusions near the ears. Those protrusions, which are not present on the model cel, are odd. So is the rather unadorned nature of the figure's form. 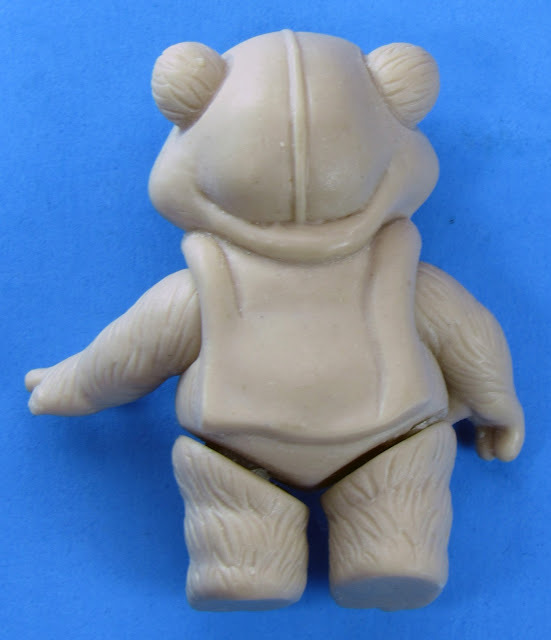 All of the other figures in the Ewoks line feature molded-on apparel and accessories. 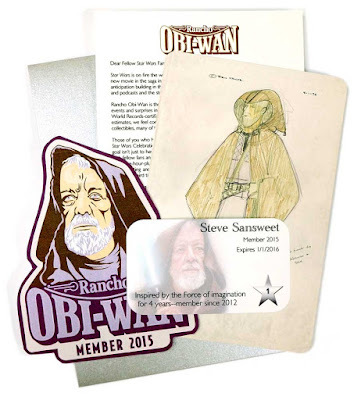 Fortunately, this image, from a batch of reference material sent by Lucasfilm to licensees, makes it clear that our Kaink figure represents the character sans exterior cloak. Interestingly, none of the figures released (or almost released) in association with the Ewoks line features removable pieces of apparel. Had Kaink been produced with a separate cloak, it would have been the sole figure in the line to bear such an accessory. From a manufacturing standpoint, this was a fairly costly proposition -- especially since Kaink was a minor character, appearing in only two episodes of the show! Of course, it's also possible that, had development on the figure progressed, that cloak would have been integrated into the body of the figure. You may have noticed that the legs on the Kaink figure are not articulated. As we'll see, this doesn't indicate that the production figure was intended to have immovable legs. Rather, it probably relates to the aforementioned cloak and complications resulting from incorporating it into the figure, either as a separate element or as a sculpted-on detail. This second image, also provided by LFL to Kenner, demonstrates that, early in the development of the series, Kaink had a longer mustache and horn-like protrusions of hair. 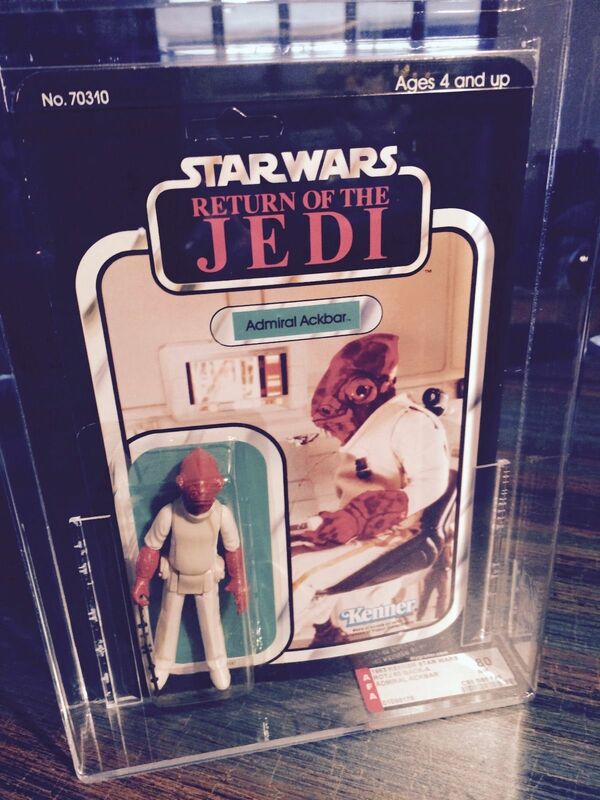 Clearly, it was from early images such as these that the folks at Kenner worked while developing their prototype. 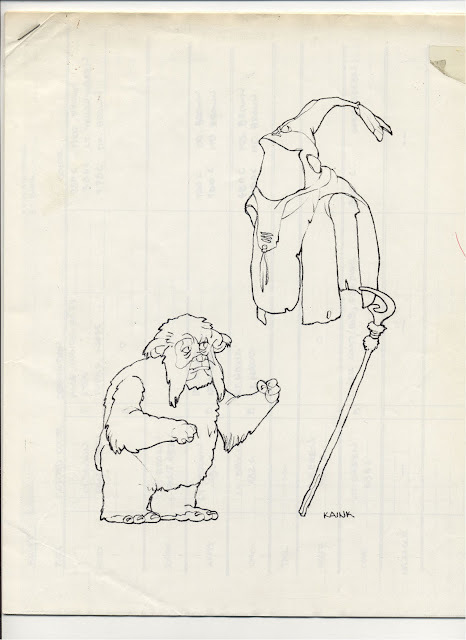 I think we can be reasonably certain that the appearance of Kaink was modified prior to production of the animated series. In particular, her hairiness was toned down. As you may have guessed, all of these pieces are composed of wax of the kind used by toy creators to sculpt action figures. However, they differ in notable ways from finished pieces of three-dimensional toy art. Although the limbs are affixed to the torsos via steel pins, as they would be on a finished sculpt, the joints lack the nylon disks typically incorporated into a wax sculpt at the very earliest stages. 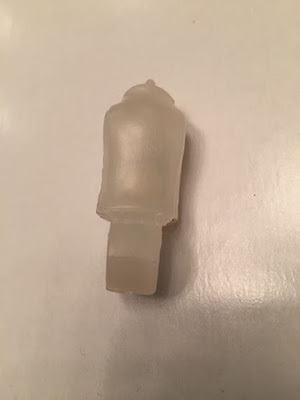 It's hard to tell just by looking at them, but they also lack the brass "buck" that is commonly incorporated into the torso of a wax sculpt. Further indication that these were developed early in the line can be gleaned from the chronology of the Ewoks cartoon. As already mentioned, Kaink appeared in only two episodes. Both of these episodes aired during the show's first season. 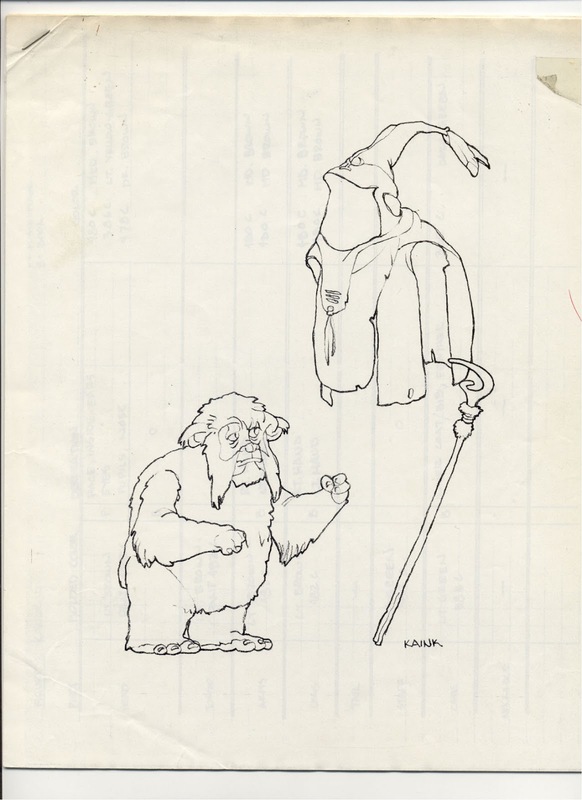 As there was no Kaink in Nelvana's Ewoks: Season Two, there would have been no Kaink in Kenner's Ewoks: Series Two. 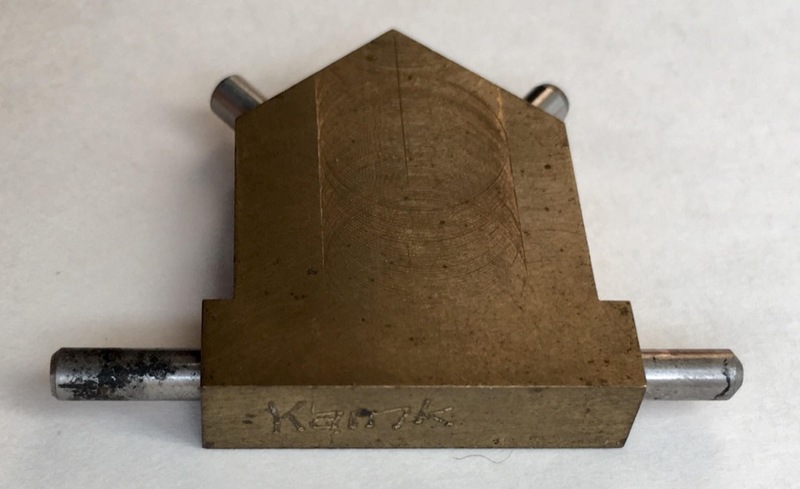 In fact, evidence that further work on these figures was planned exists in the form of a brass buck created for use in the never-executed final sculpt representing Kaink. The buck, made from machined brass, would have been incorporated into the torso of the Kaink sculpt, and would have allowed the sculptor working on Kaink to properly proportion and articulate the figure. 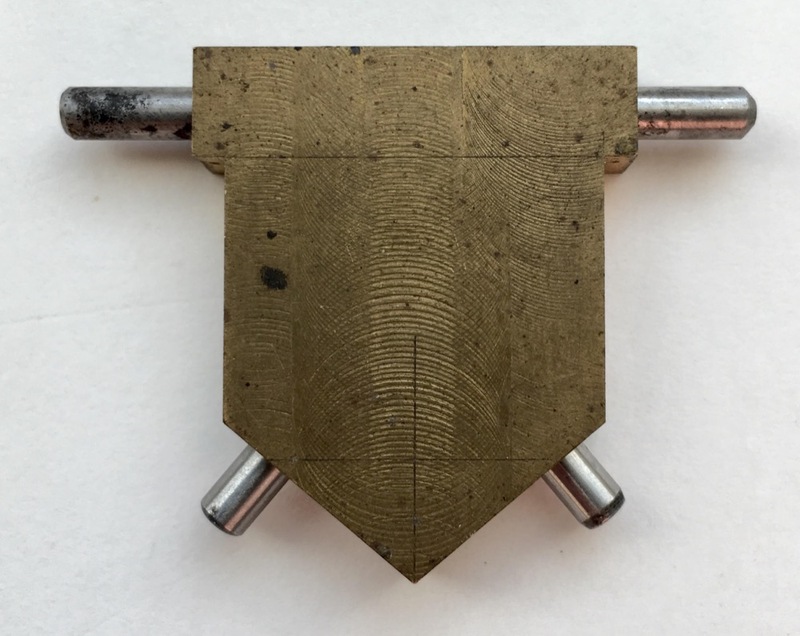 Each steel pin you see extending from the block would have been inserted into a nylon disk recessed into the joint of each wax limb, allowing for a snug fit and smooth movement. As the buck includes pins corresponding to the figure's legs, it proves beyond doubt that Kaink's legs would have been articulated. Thanks to Todd Chamberlain, Chris Georgoulias, and Tracey Hamilton for contributing to this post. Ralphie: I want an official Kenner swivel side cannon action battle stomping SCOUT WALKER! Santa Claus: You'll stomp your eye out, kid. 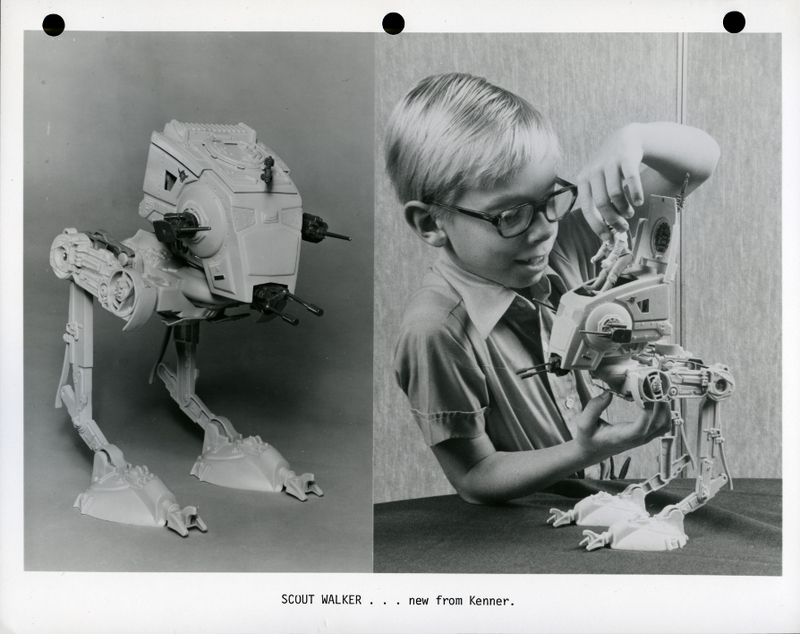 I've always thought the kid featured in the photograph above was the vintage Kenner Star Wars equivalent of Ralphie from A Christmas Story, with similar Christmas dreams and aspirations that were fulfilled just the same (hopefully with spectacles intact). Stills such as this have turned up from different types of sources, including newspaper archives and groups of catalog-related items, indicating that they may have been sent to retailers and wholesalers in addition to being included in press releases. 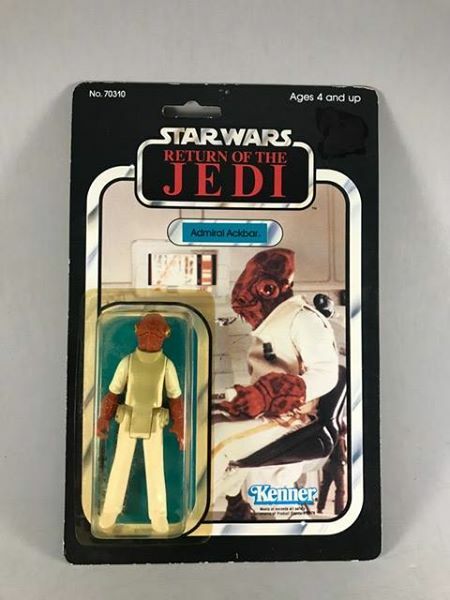 In any case, it's a fun image featuring one of the more endearing Kenner Kids that may not be as familiar as others from the earlier Star Wars products. 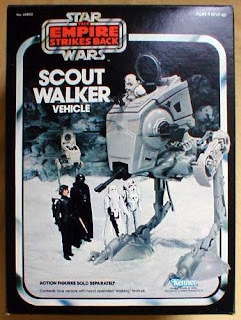 The Scout Walker was initially released in 1982 as part of the Empire Strikes Back line following an extremely brief appearance in the film during the Battle of Hoth. When did a passing glance onscreen ever eliminate a cool character or vehicle from toy consideration? Well, describing Prune Face as "cool" is slightly more questionable, but I digress. Featuring swivel side cannons with clicking "laser machine gun sounds" (I don't recall ever seeing the term "machine gun" associated with a Star Wars toy) and perhaps most importantly, the ability to "stand unassisted," the Scout Walker (or AT-ST) would go on to pay a prominent role in Return of the Jedi, providing even greater returns on Kenner's initial investment. I mean, the thing even makes the Vehicle Maintenance Energizer seem awesome in this commercial. What's not to like? 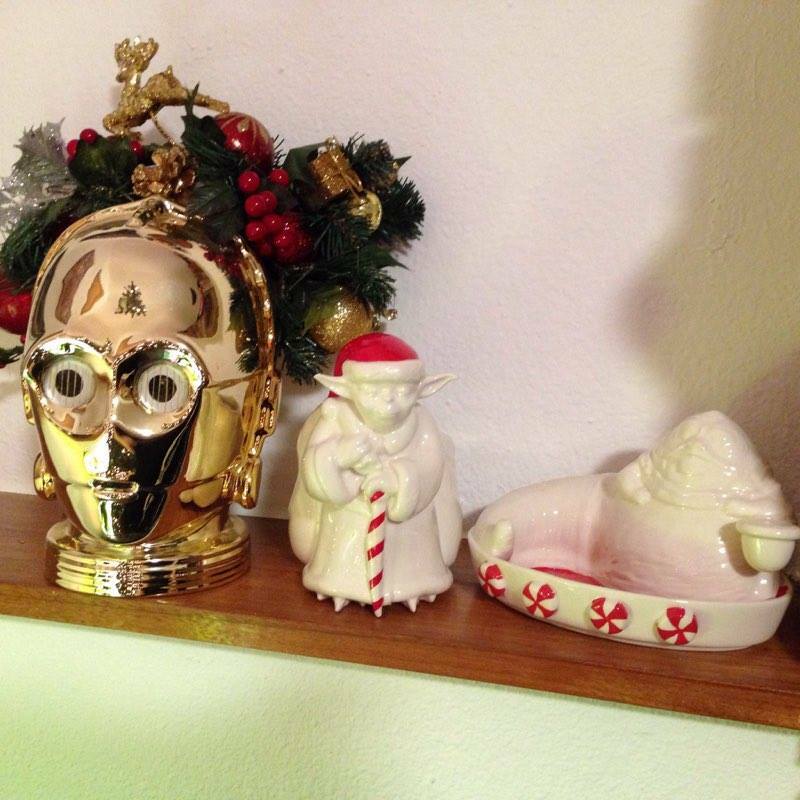 Happy Holidays from the SWCA! 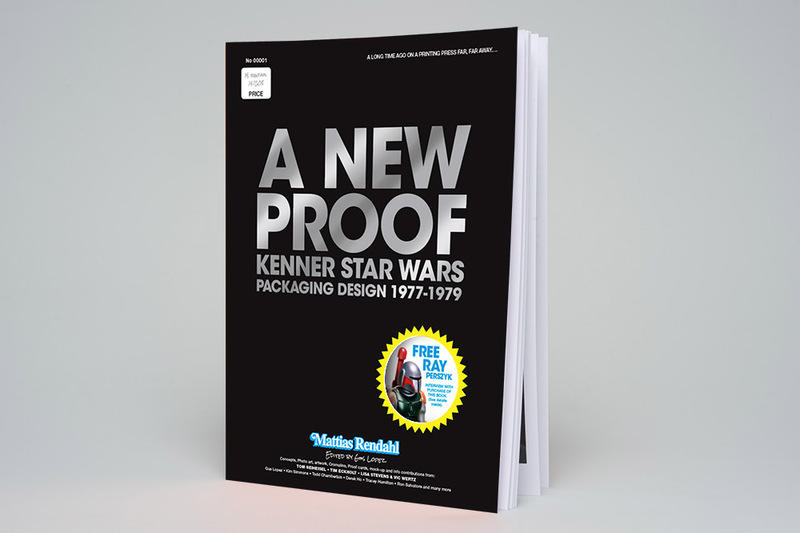 Special thanks to Todd Chamberlain for providing additional background information on Kenner press stills. Since the holiday season is winding down, I thought it might be fun to help out the people who are shopping for last-minute gifts for the collector in their lives. It's often difficult for non-collectors to know what to buy, since the hobby is very specialized and can be confusing. 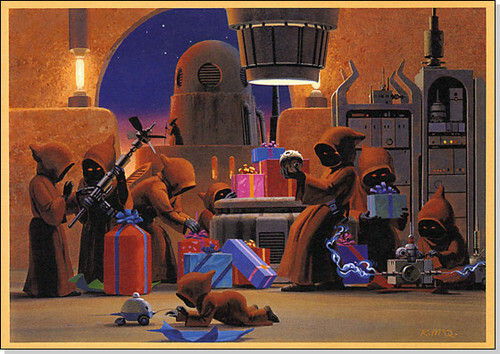 With that in mind, I asked a number of prominent Star Wars collectors what they would suggest as a gift. 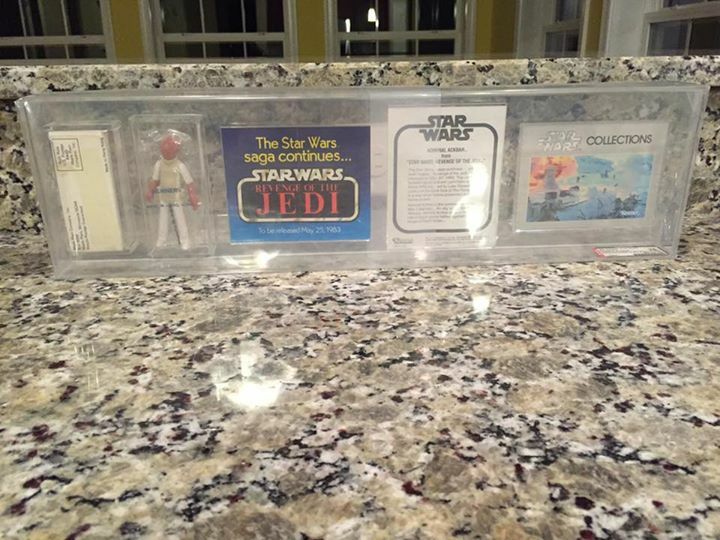 Because if you want to know what a collector wants, it only makes sense to ask collectors. 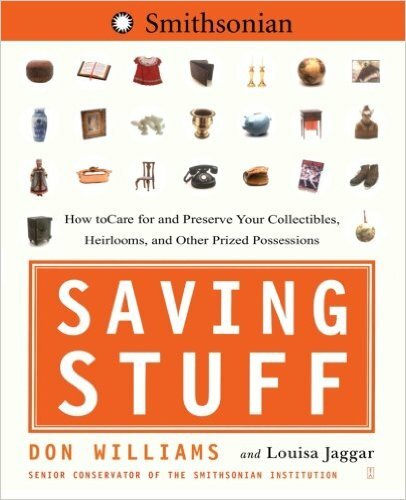 Personally, I would suggest books on collecting. There are a number of different guides which can be an excellent part of a collecting library. Books like the hardcover Tomarts guide are an awesome resource, even if the prices are out of date now, and it can be found on Amazon and eBay very inexpensively. Another option would be the vintage Micro Collection toys from Kenner. They can be found on eBay very inexpensively and a lot of collectors overlook them and probably don't have them yet. They serve as a nice counterpoint to the more popular (and larger) figures the collector in your life might already have though, and most collectors really like them once they have them in hand. 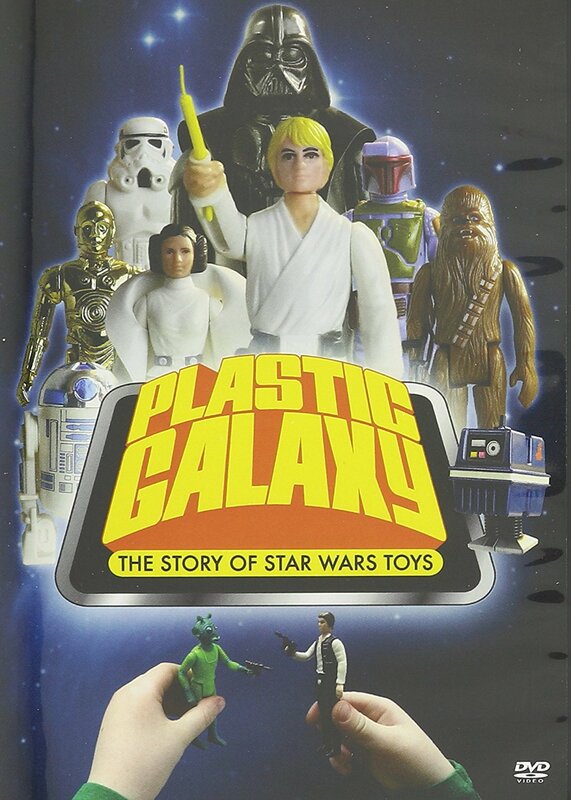 Lastly, I would suggest Plastic Galaxy, an excellent DVD documentary on the history of vintage Kenner Star Wars toys. It is very interesting to see how and why the toys were created the way they were, and it makes a great affordable gift. A New Proof by Mattias Rendahl covers the history of vintage Star Wars packaging design and can be ordered here. The Force in the Flesh by Shane Turgeon is a coffee table book showcasing Star Wars body art. It can be ordered here. 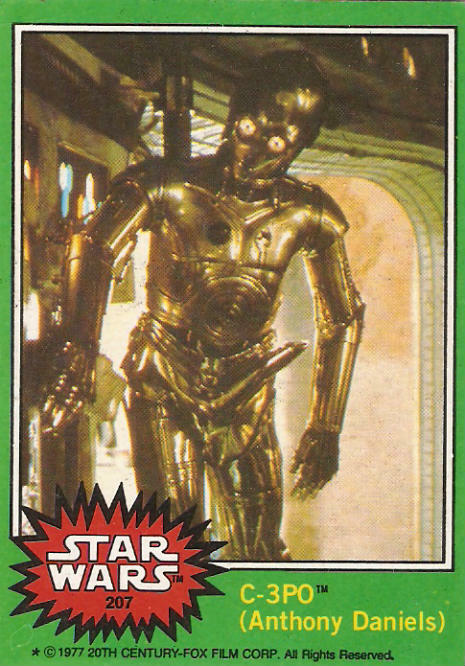 A vintage C-3PO Star Wars trading card by Topps, which is always very popular with collectors because of the strange X-rated addition found in the image. "I like the book idea. Art books are fairly generic and you can find decent used ones on eBay or Amazon for around $10. T-shirts are pretty generic. TeeFury and other sites have some unique art. You know me, Chirashi [small Japanese movie posters] can be a pretty cool gift. For like $25 or so you can get 1 or more from all 9 movies [7 episodes, Rogue One and the Clone Wars cartoon]. Nice memento from the series." "You can never go wrong with a fun bootleg ceramic piece. 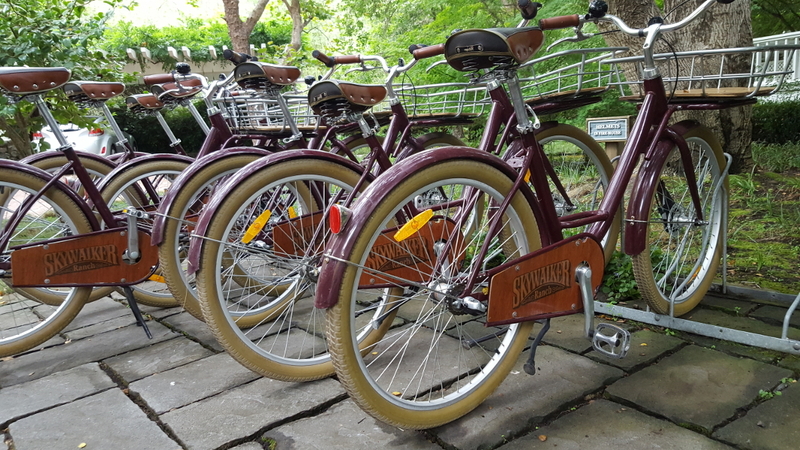 One they're vintage, and secondly no two are alike." Vintage licensed Star Wars ceramics released by the Sigma company are a more expensive option. "Then again there's always Sigma vintage." 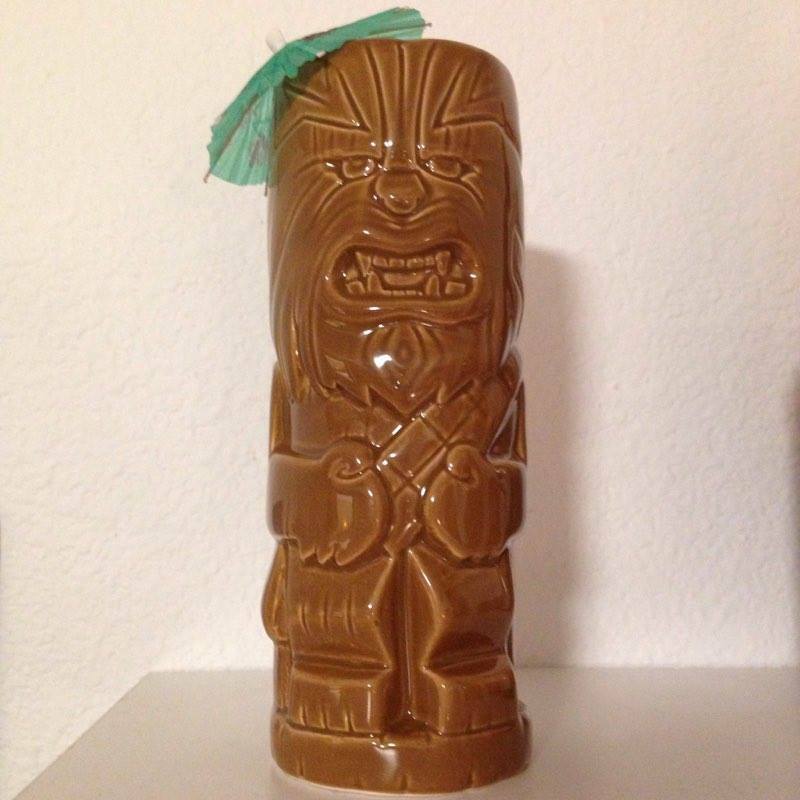 "And for the modern twist try a geeky tiki mug (you'll have to add your own umbrella.) "
"My first inclination would be to just say 'anything funky from The Toy Chamber.' But as far as a specific item that's awesome and affordable, there's the R2/3PO Immunization Poster." Preservation and display is a large part of any collection and something every collector should know about. Another idea, while maybe a touch on the expensive side, is the Star Wars The Black Series Imperial Stormtrooper Electronic Voice Changer Helmet. I know, it's a) modern and b) a "toy." But in person this thing is fantastic! 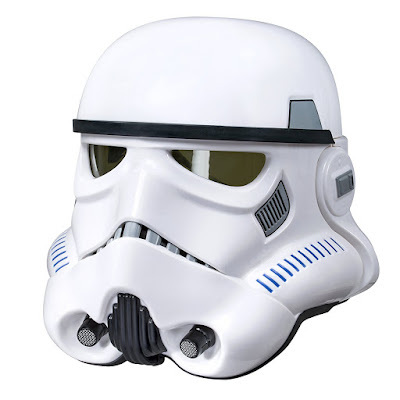 Very well made and an almost dead ringer for an actual vacu-formed 501st Stormtrooper helmet. It would look fantastic in a display or along side prop replicas. 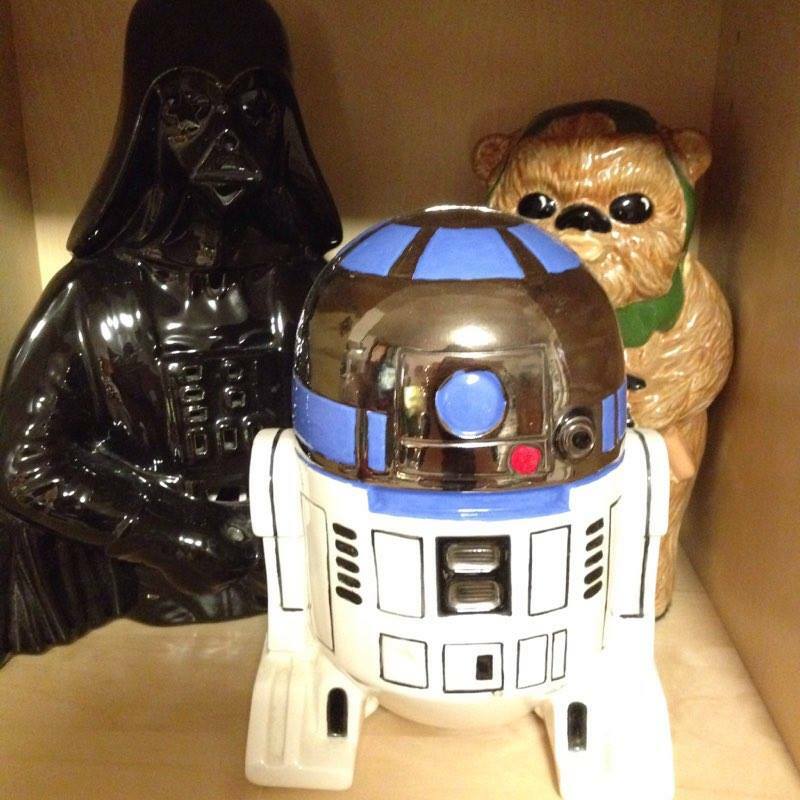 Last but not least, one of my all time favorite Christmas gifts Aimee grabs for me are Oscar Acrylic Cases. At $16.50/case they are a fantastic bargain. 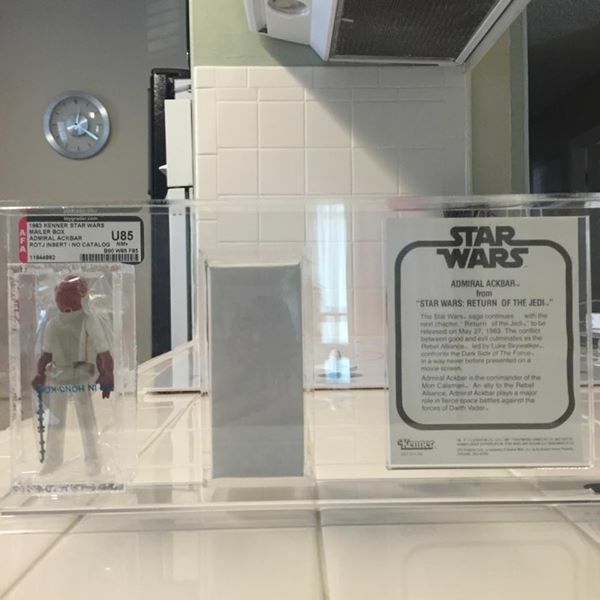 The best part is it's supporting a fellow collector and his business." 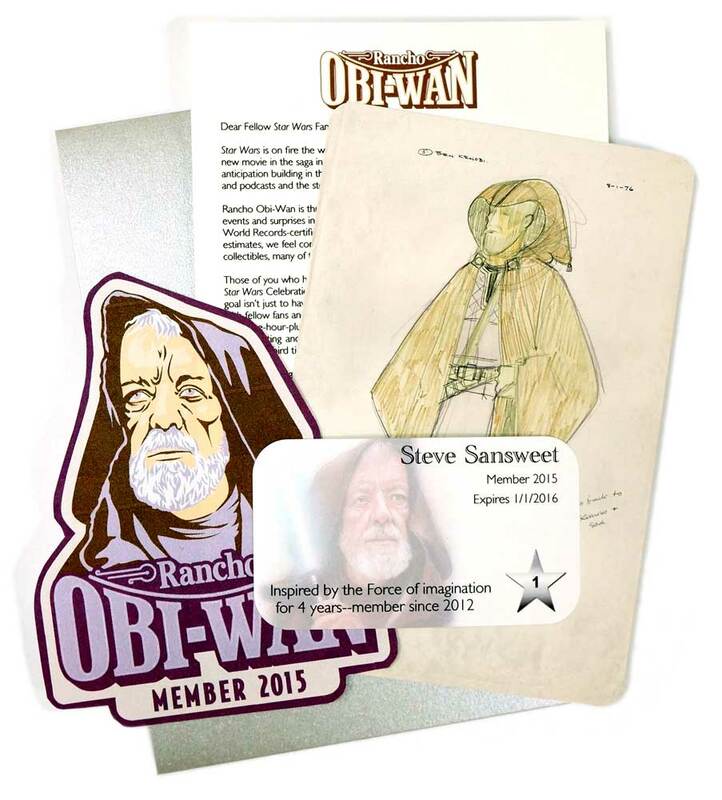 Concept to Screen to Collectible, by Steve Sansweet, covers the history of Star Wars and the merchandise it spawned. "I would recommend From Concept to Screen to Collectible, and old issues of action figure magazines, in particular the issues of Tomart that include all those hardopies (Tomart's Action Figure Digest #60 and #64). Available for cheap on eBay, I'm sure. Though it's probably too late now to get them in time for Christmas." And so there you have it, plenty of good options to fulfill your last-minute shopping lists. Our second figure in the ROTJ line is our favourite Mon Calamari war hero, Admiral Akbar -- interesting figure as he was available as a mail-away towards the end of the ESB line. So not only do we have MOCs and loose figures, but individual mailers of the figure out in the market. 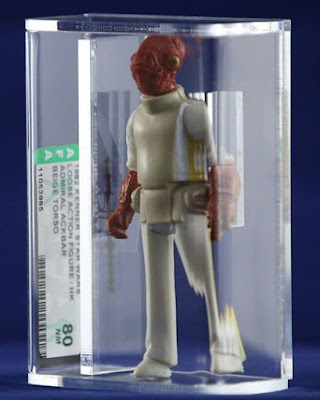 And as Skye speculates on 'Chive Cast 78: Ackbar Beez in the Trap, you do wonder if he was to be intended to be a more significant player in the Star Wars universe. As I've mentioned we are using Facebook to get data but it hasn't been until Admiral Ackbar where I've been able to find a decent amount of examples. 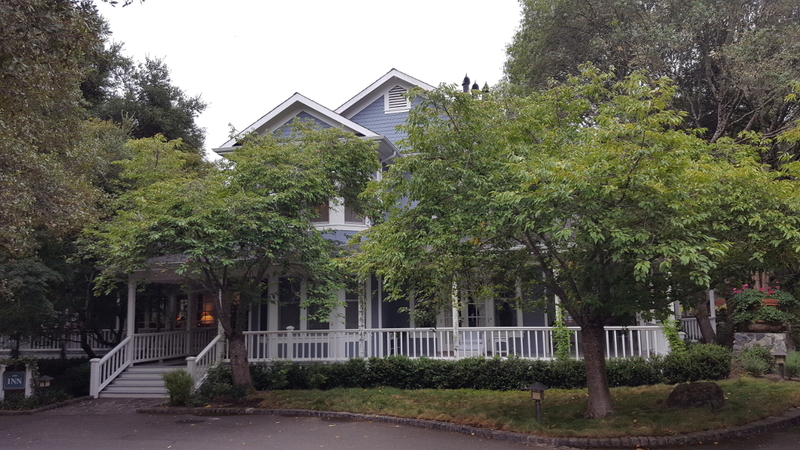 The fact SOLD prices are in the main retained on the Facebook posts is a great resource for collectors. 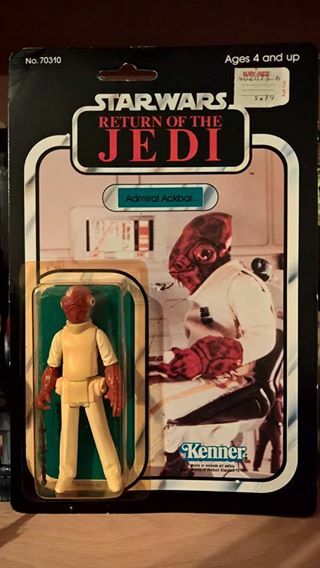 Great round up of Ackbar items on Facebook. Big shout out to Ross Barr who has been great in running these pages (with plenty of others aiding) but importantly championing that prices remain in the respective posts. This is a great resource, and it was really good to compile data from Facebook, almost exclusively. 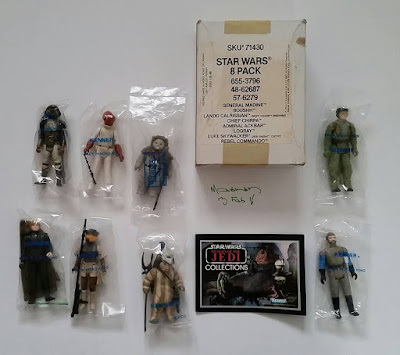 I had actually found quite a few Luke Jedi items on Facebook, but they hadn't appeared to have SOLD, and had actually showed up on eBay as sales. 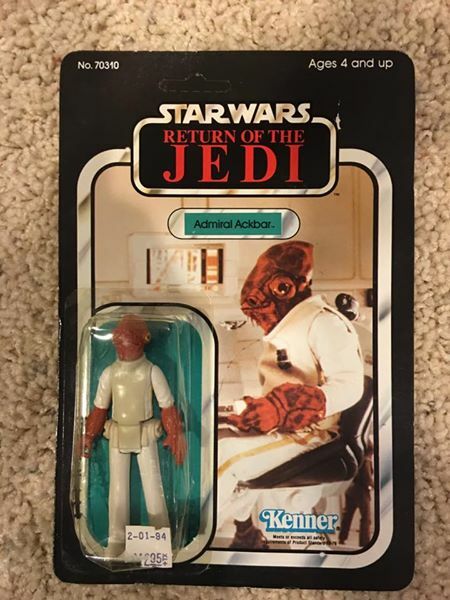 Ackbar was quite different -- plenty of auctions, and even the pre-production piece all selling on Facebook. I would recommend joining the auction groups, and keep an eye peeled for good deals on the other pages. 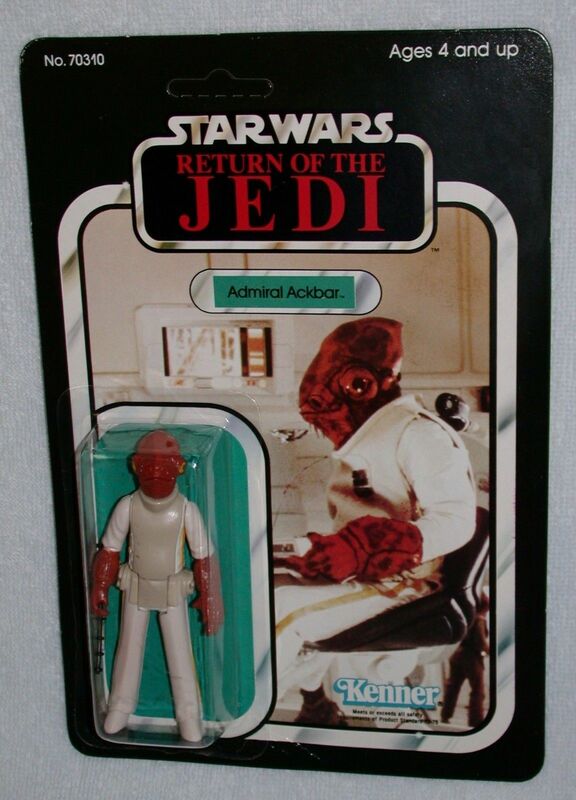 All in all, some good deals for Ackbar were had, with most MOCs well under $100. The one graded example of the debut card was not a surprise at over $200 (though I do wonder if back in summertime if we would have seen more for that item). Next month we will get back in sync with the podcast with Leia Boushh... in the meantime, Wampa Wampa. We’re delighted to have Brandon Alinger – one of the co-authors of the recently published (and literally monolithic) book Star Wars Art: Ralph McQuarrie – join us to share some insights about the ambitious undertaking of compiling and presenting the legacy of one of the franchise’s most prolific creative forces. A collector in his own right, Alinger also serves as Chief Operations Officer of Prop Store's United States operation in Los Angeles. Steve Danley: When and how did the project originate and how did the co-authors come together? 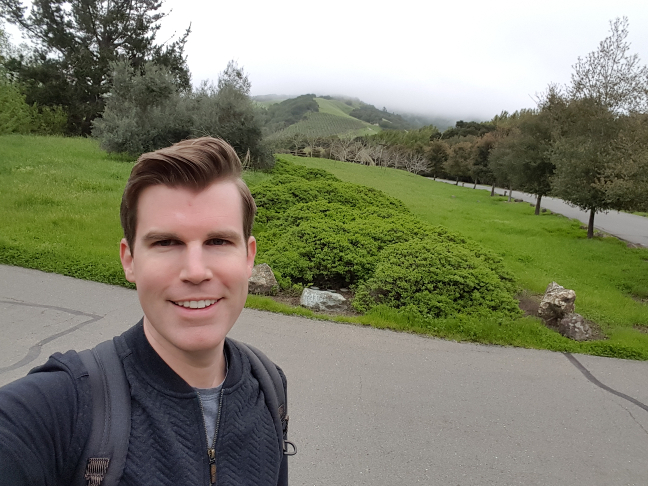 Brandon Alinger: The project really began with J.W. Rinzler, who is well known to Star Wars fans for the wonderful “Making Of” books he did on the three original films. Rinzler wanted to do the definitive McQuarrie book for some time, as did Abrams, the publisher. After I wrote Star Wars Costumes: The Original Trilogy in 2014, Rinzler told me the next archival title on the slate was the Ralph McQuarrie book, and it was mine if I wanted it. BA: I knew it would be a great project but also a large workload. David Mandel and I were friends for many years and I knew he was a Ralph McQuarrie enthusiast. David was long-time friends with Wade Lageose and suggested pulling Wade in as well, as Wade was also a McQuarrie enthusiast and had the added benefit of having known Ralph for more than ten years. Wade spent a lot of time with Ralph in the 90s and early 2000s. Each of the three of us brought a unique angle and skill set to the project. SD: The scope of the book is sprawling, to put it mildly! Was the goal always to be completely comprehensive, or did that emerge as the research process progressed? BA: That was part of the brief from the beginning, and as authors that was really the carrot that drew us to the project. McQuarrie’s work has been published in the past, going all the way back to The Art of Star Wars which was released after the original film. There have been other nice books done on Ralph’s work in the past, and some which had his direct input. In the absence of his direct input, we wanted our book to be as comprehensive as possible – both in the artwork shown and the story told. SD: The book's chronological structure presents an approach unlike previous publications featuring McQuarrie's Star Wars work. How was the organization of the book developed? BA: We looked at several possible methodologies for the book; the most obvious approach would have been to present the art in story order – an order very familiar to many readers. Rinzler really pushed the idea of laying the art out chronologically, so the reader could follow Ralph’s journey. In doing so the book became a visual history of these films, and a great “Making Of” companion, with a very specific scope. Beyond the beautiful artwork, there’s a real story here about the development of these landmark films. SD: One of the most fascinating aspects of the book is its ability to place each work in proper context, with assemblages of each iteration of a concept or illustration culminating in the final work that many fans are familiar with. Did this method pose any particular challenges? BA: It was challenging because the information available to us was imperfect. 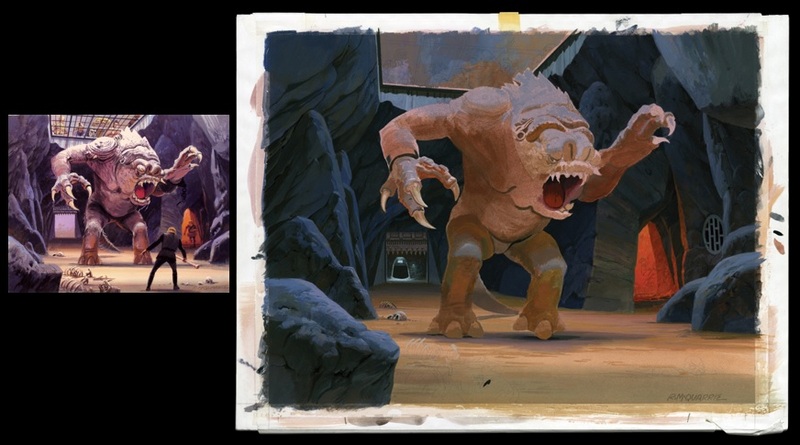 We had certain key resources – like McQuarrie’s day calendars from the period – which outlined many of the key dates, such as the production paintings. But not every piece was dated, especially when we got into the sketches. So we organized the paintings as the key running narrative and tied the related art to those in what we felt was the most likely chronological order based on the clues available. It was real detective work at times – cross referencing different data sources to interpret a possible timeframe and place it on our master timeline. SD: If you were to choose personal highlights from each of the three films, what would they be? 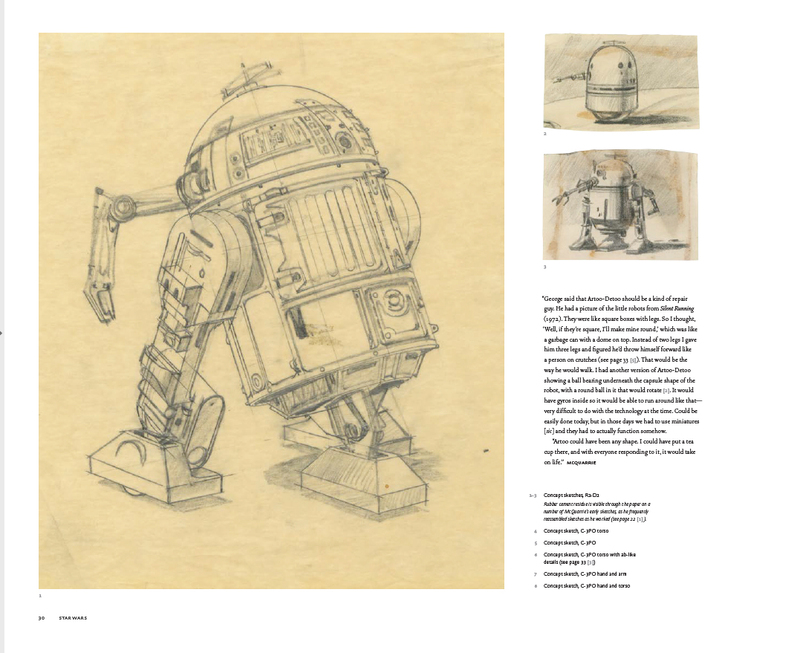 BA: For Star Wars, I’ll say the first sketches of R2-D2. There were a couple of different concepts but each got no more than a single sketch, and then he hit on what was very close to the final version. BA: With Empire I will jump to the matte paintings. His series of Cloud City reactor vane matte paintings is simply stunning to behold, and the fact that he did matte paintings in addition to concepts shows how multi-faceted Ralph was. BA: One particularly beautiful Jedi painting shows Luke and Vader entering a rather gothic-looking Emperor’s castle. It’s very different to where they ultimately went with that set, but I love the image – the idea of Vader and Luke going to see the Emperor, which is really the conclusion of the Star Wars saga – especially at that time. SD: Getting back to what it took to put this together – where did the research process begin, and how did it unfold? BA: The project started with a trip to Skywalker Ranch with Jonathan Rinzler and Eric Klopfer, the publisher at Abrams. Getting to work at the Ranch is one of the real perks of a project like this. 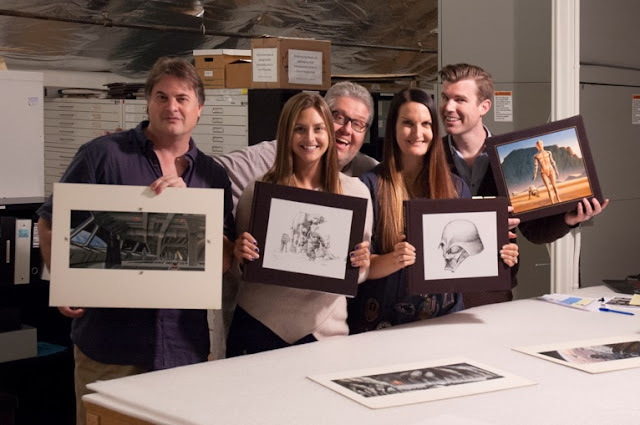 We spent three days going through the flat files and making an initial catalog of what was there, physically, in the Ranch Archives collection. From there we progressed to other key resources, such as Lucasfilm’s digital image library and relevant interviews in the Ranch library. And then we branched out into external sources – we collaborated with the Ralph McQuarrie Archives and with many of McQuarrie’s colleagues from the period. SD: As someone with a background in libraries and archives myself, I can only imagine what an incredible experience that must have been! Regarding the interviews, the book contains a multitude of period anecdotes from McQuarrie and those that knew and worked with him. What were the most fruitful sources for these stories? BA: The key source were archival interviews that the librarians at the Ranch located for us. 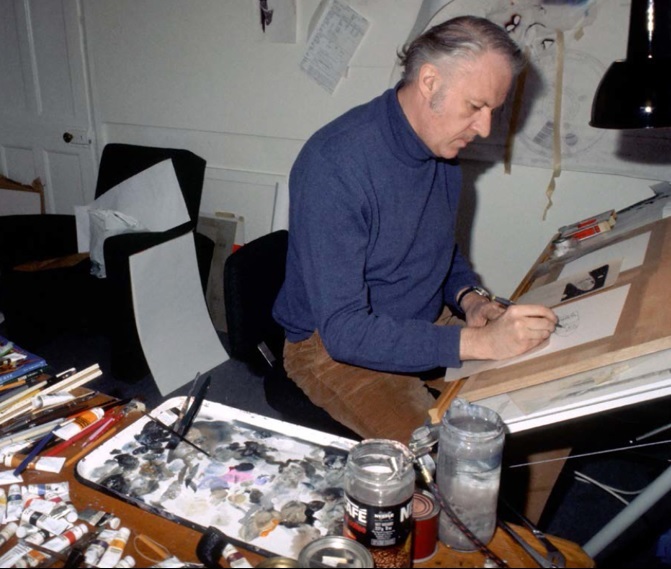 Fortunately, we aren’t the first ones to take an interest in McQuarrie’s work – far from it! 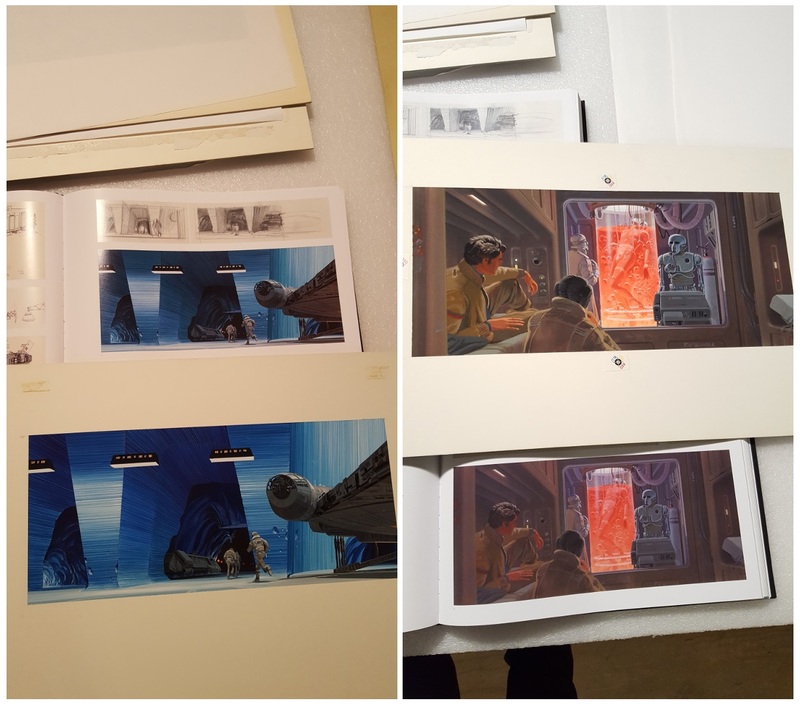 Lucasfilm’s publishing department in the late 70s and early 80s utilized McQuarrie’s paintings and sketches in the “Art Of” books as well as the Ralph McQuarrie Portfolios that they put out. They conducted fairly extensive interviews with Ralph at the time where he discussed each piece in great detail. 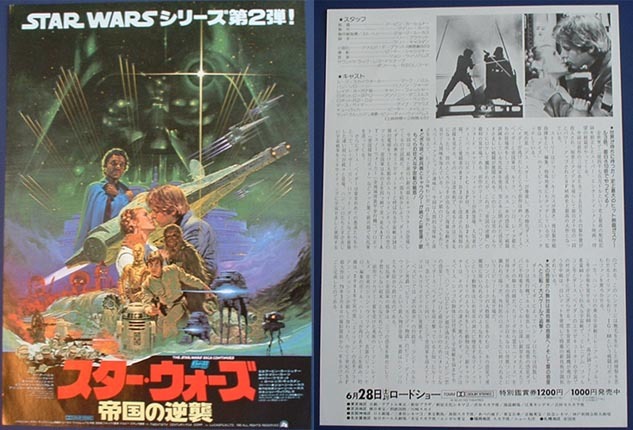 Other interviews were done for the Star Wars Fan Club at the time, or done later as part of a Lucasfilm history project. In the absence of Ralph himself, the best information definitely came from these – the period interviews are wonderful because it’s so fresh. 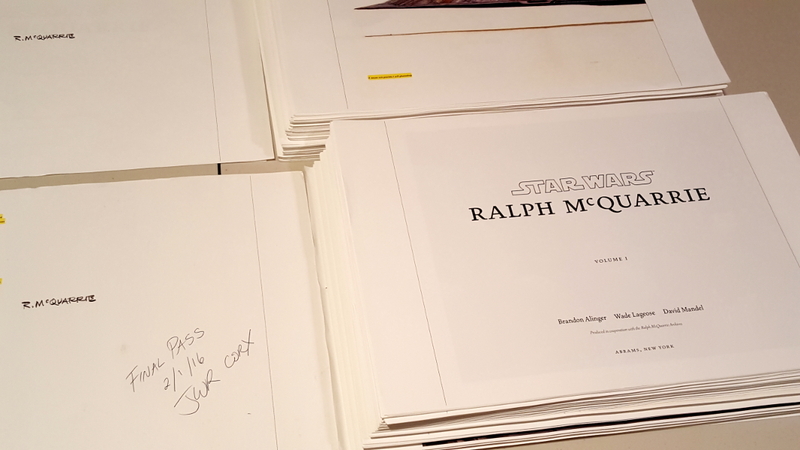 We conducted more than 30 new interviews ourselves which also yielded some wonderful stories and quotes, but the key source was the archival McQuarrie interviews. SD: Of the new interviews with McQuarrie's cohorts that were conducted specifically for this book, which were the most enlightening or memorable? BA: Craig Barron and Harrison Ellenshaw, who both spent a large amount of time with McQuarrie, were extremely helpful to us. They visited the Ranch and looked at matte paintings and other artwork and had many wonderful insights and stories. Ralph’s fellow designers Joe Johnston and Nilo Rodis-Jamero gave us some great information, and helped identify whether certain pieces were his or not. We had great interviews with Gary Kurtz, with Howard Kazanjian – with many people really. SD: With more than 1,000 pieces being newly scanned or photographed exclusively for this project and many others being published for the first time, how did the book's production process evolve? SD: What new visual discoveries were the most eye-opening for the authors? BA: Initially the most eye-opening thing was just seeing the artwork in person. It’s cliché, but there’s nothing like seeing it in person – though we hope this book is the next best thing. I personally had a lot of fun going through the early drafts of the first film and comparing Ralph’s sketches to the text. It was apparent he was working directly from it, and based on the action being drawn you could date a sketch to the second draft or the third draft, for example. We included those script excerpts so readers can see the inspiration as well. 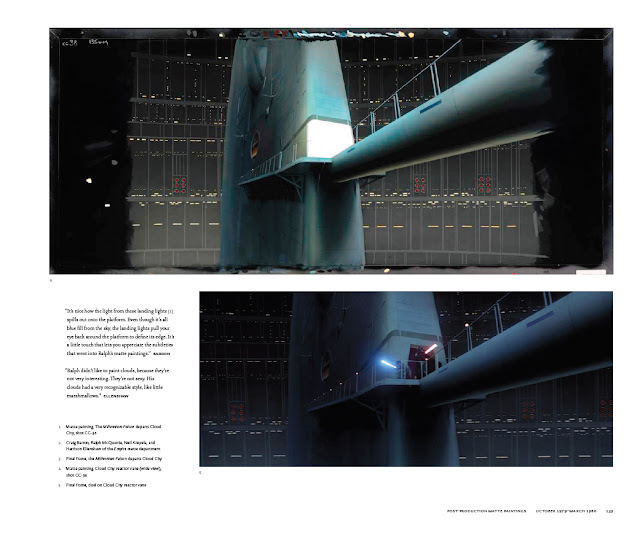 SD: The collective body of work contained in the book reveals the wide-reaching impact McQuarrie had on the films' entire production and promotional process in ways that fans may not be as aware of. Was this an intended objective from the start? BA: Oh yeah! 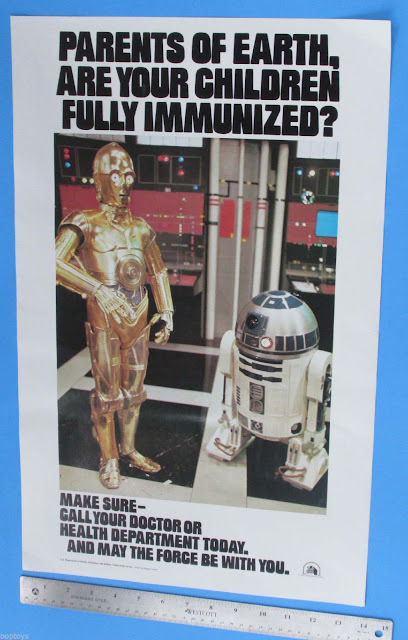 The goal was to spread awareness on McQuarrie’s Star Wars work. I think the film work is undeniably the most significant, but all the work is wonderful. 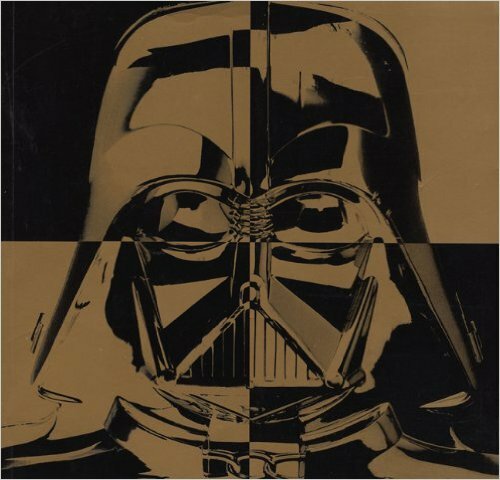 SD: With many artifacts from the original films' production (from props and costumes to artwork) having made their way to the collectors' market over the years, what role did the Star Wars collecting community play in publishing the book? BA: We reached out to a number of private sources that had McQuarrie pieces, and fortunately everyone was agreeable to helping out and contributing scans to the book. There were some really wonderful pieces in private hands that the book would not have been complete without, so that was nice. SD: The book describes itself as being 40 years in the making, which is an apt definition given its historical reconstruction of McQuarrie's Star Wars career. His work in the years beyond the three original films is given ample coverage as well. What do the authors envision as the ultimate takeaway for readers, be they casual fans, collectors, or hard and true Star Wars enthusiasts? BA: I suppose each reader will have their own “ultimate takeaway.” For me, the ultimate takeaway is that McQuarrie was almost the hand of George Lucas – drawing everything Lucas was thinking. He did not do everything. 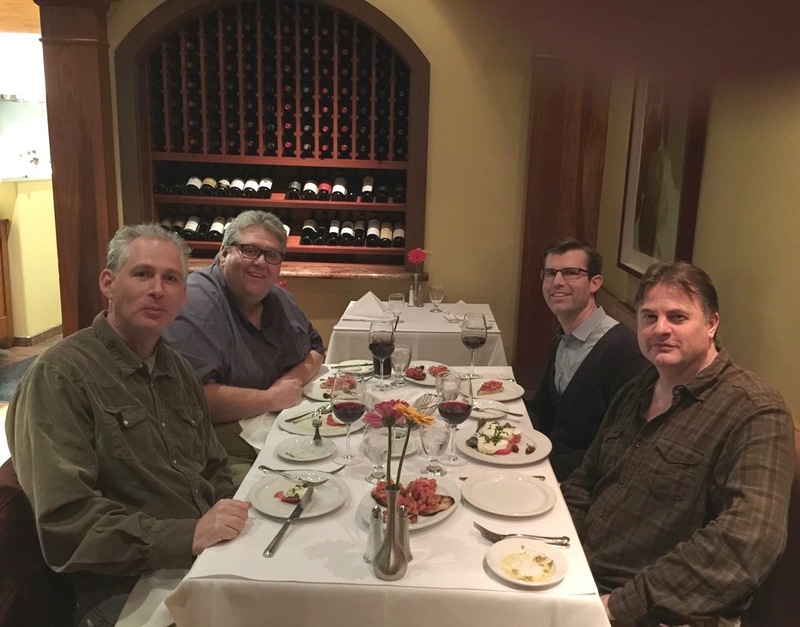 Major contributions were made from other people – Joe Johnston, Colin Cantwell, John Barry, Nilo Rodis-Jamero, John Mollo – lots of folks. But Ralph did an awful lot on all three films, and perhaps most significantly, he established the look of the characters. When you see the earliest sketches of Vader, Threepio and Artoo and you read that they were done in a single day...it’s quite remarkable. George described them, he drew them, and they were born, so to speak. Amazing.